Are we talking about LCK in the threads? Because that LCK was one of my favorites ever. * At the end, both of the folks responsible for dragging their teammates down with a bad dish decided to try and defend it with verbal diarrhea at the judges' table. In both cases, the other team member stood there professionally tight-lipped, even when being nudged slightly under the bus. I'm impressed with how those two maintained their cool. * Joe is a perfectionist and butted his way into every decision... but not when it mattered? It's not like Tu was giving him the kind of pushback that Chris was. Tu seemed very open to advice. * Even if you made the perfect lamb and the perfect grits, you can't plate it like that when it's being compared to the plating of 12 other professional chefs. 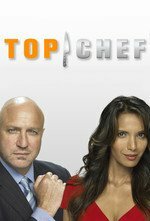 * The judges on Top Chef never really like grits that much, no matter how well done it is. * My dude made grits in two hours. It's not like, say, the beignet where you are at least making 200 individual ones. You're making a pot of grits. * I did not know mushrooms are peeled, ever. Tom was straight-up savage at the judge's table. "Would that have made it taste better?" Holy cats, watch this LCK if you don't watch any others. Moustache Joe is starting to really annoy me, and this is only two episodes in. If he thought Tu wasn't cooking the lamb right on their joint dish, it was his responsibility to say so. Tall redhead judge was hawt ... but, surprisingly for a chef, he turned out to be somewhat of a fussy eater when it came to tasting the food. I agree it was weird and bad to be talking over everyone except when speaking up would have actually helped. This sort of behavior can be the result of deep-seated insecurity combined with an unwillingness to appear weak. I did not know mushrooms are peeled, ever. It's a very old-school French thing to do. I think Julia Child describes it in her classic first book, including ways of doing it decoratively, like just peeling thin strips off in a spiral design. It's the kind of thing Jacques Pepin sometimes does in his cooking shows where he describes it like "in the old days we used to peel them like this, to make them look fancier, but if you don't want to it's fine to just skip it." The chef that said, "I don't do the mise en place in my restaurant, I haven't peeled mushrooms since I left France in nineteen *mumble mumble*" cracked me the heck up. How do I watch Last Chance Kitchen? It doesn't seem to be an option with my Sling On-Demand. LCK is online only. I think it's on the Bravo website, or also if you get the Bravo app on Roku/Apple TV devices. I use SlingTV also and the Bravo app lets me "log in" with my Sling account to watch shows. LCK, which is awesome in its new format, is available on OnDemand on our (Spectrum cable) tv, but it's not listed as its own show. It's mingled in with the regular TC episodes. It's also at bravo.com. The AV Club write-up made me lol. Re: Marcel's hair: Also, dude’s gotta be keeping chef knives in that bindle sack he calls hair. Also, dude’s gotta be keeping chef knives in that bindle sack he calls hair. Seriously, every time he's been on screen in LCK I've been distracted by that hair. Like, I want close-up stills of it to try to figure out how it even works. And how much time every day does it take to tie it up like that. It doesn't seem to be an option with my Sling On-Demand. You have to search TCLCK separately; it does show up. Some of the returning contestants seem to have grown and changed as people. Poor Marcel.